Drip irrigation system is a type of micro-irrigation of soil which has the potential to save water and nutrients by allowing water to drip slowly to the roots of plants. This leads to the wise use of water and also makes water reach the roots of plants and minimize evaporation. Drip irrigation systems distribute water through a network of valves, pipes, tubing, and emitters. Its efficiency depends on how well the system is designed, installed, maintained, and operated. To explore more projects visit http://thestempedia.com/projects. You can buy an Agritech Kit for this as well, which includes all the essential components. With Agritech Kit and evive, you can make yourself an Automatic Drip Irrigation System with Smart Monitoring System using various sensors. We will post these projects soon on Instructables. In this project, we will be using evive Drip irrigation kit. This kit consists of various components out of which the following some are required. Feeder line pipe is used to transfer water from water tank source to the drip irrigation system. It is also used to connect the T-connectors to make different connections. Drip emitter is a small piece used to water the plant drop by drop. It is connected to the T connector with the help of the feeder line pipe of around(2.5 cm as per our requirement). T connector is a T shaped piece of plastic which connects one drip emitter to the adjacent drip emitter with the help of feeder line pipe. Emitter stakes are stands with a curve at the top and pointed at another end. It will help to provide stability to the feeder line pipe drip emitter connections. A 12V,3W Water pump is connected at one end of feeder pipeline. The male end of the water pump is connected female dc connector. Plan how you want to implement the drip irrigation. Once planned, measure the distance between your plants. Each emitter will water 1-2 plants. We will make cut off the feeder line pipe according to the required dimension of our setup. Feeder line pipe is cut in different sizes so as to fix the connection between T connector and Drip emitters. Now, one end of the T junction fully connects the pipe as shown in the figure. Make sure the length of the pipe is not too long or too short. Now insert the adjustable emitters to the other end of the pipe. Now the setup consisting of one Drip emitter looks like as shown in the figure above. We can connect the above setup in a series according to the required setup. Since both the ends of setup are open. One end is connected to the water pump. Block the free end of the pipe using a glue gun. Place the emitter stacks near the plants and mount the pipes. Adjust it to change the flow. A water pump is taken and the end wire contains a male connector which is connected to the female DC connector as shown in GIF. The male end of jumper wires(2 wires) are connected to female DC connector. The female end of jumper cables is connected to evive motor M1 slot as shown in the figure. Dip the water pump in the water reservoir. evive is powered with 12V,2A power adapter. The circuit diagram explains the connection of the water pump with the evive board. The water pump is interfaced with evive using a female connector. 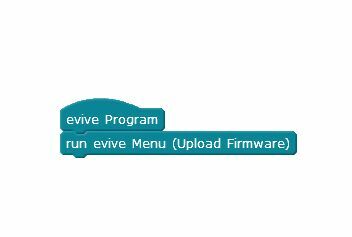 evive Program block is a Robot block and a Hat block. This block gets converted into Arduino code. run evive menu block is a Robot block in the evive TFT display. This block upload he evive firmware directly in the scratch. Upload the following script in m-blocks. It will open the evive menu. Now go the evive menu >> select controls>> select Motor1. Now we can control the water pump flow with the help of evive potentiometer 1. With this, you've successfully made your own drip irrigation system! Take care of your precious garden the smart way with this system and show it the love that it deserves. This video will show how the drip irrigation system will work. Make sure you don’t overflow your irrigation area…. To control the drip irrigation system wirelessly do watch our project titled “Wirelessly Controlled Drip Irrigation”.